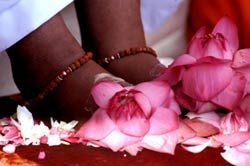 Everything was waiting: Amma’s chair, the tray heaped with lotus petals the purnakubham, Amma’s disciples, Her devotees. There wasn’t an inch of free space in the stadium—all together more than 150,000 people were waiting in a prayerful mood to witness Amma’s birthday padapuja. When Amma walked to the stage that morning, She was also welcomed by a symphony of horns, conches and cymbals—panchavadyam, the temple music of Kerala. As Amma made Her way to Her peetham, She carefully sidestepped the pathway of flower petals that had been layed out for Her. Instead of walking on them, She grabbed them up in handfuls and showered them upon Her children as She walked past. After Amma took Her seat, Swami Amritaswarupananda garlanded Her and then began the puja, assisted by Swamini Krishnamrita Prana. First, Swamini gathered Amma’s skirt, gently draping it to the side of Her chair so that Swami Amritaswarupananda could begin. 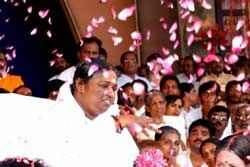 Meanwhile, Amma took more flowers—meant for worshipping Her—and used them to worship Her children, lovingly throwing them on all the devotees standing near. 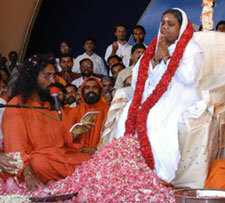 Swamiji delicately lifted Amma’s feet and placed them in a sliver tray for washing, first wetting them with water. He then continued by making the traditional offerings of milk, curd, honey, ghee and rose water, one by one. Finally, he lifted Amma’s feet once again and dried them with a white cloth. The puja concluded with Swamiji drawing three lines with sandlepaste across the tops of Amma’s feet, dotting them with kumkum powder and placing one large pink lotus atop each foot. Amma’s sannyasin disciples then led the entire stadium in chanting slokas from the The Guru Gita, ending with “guru brahma, guru vishnu, guru devo maheswarah, guru sakshat param brahma, tas mai sri guruve namah.” Then Swamiji led the chanting of Amma’s 108 Names. After each name was read, the entire stadium rang out with the response “Om Amriteshwaryai Namaha” [Salutations to She Who is The Immortal Goddess]. In the heart of that terrific sound, one could also hear a sacred silence. After the arati flame was waved before Amma, Amma’s sannyasin disciples took turns garlanding Amma and prostrating before Her. In the end, Amma, whose hand’s were rested against one another in pranam, was covered in garlands.